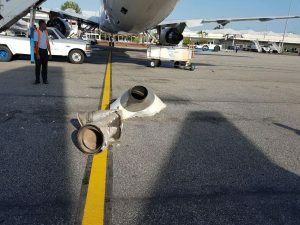 The Fly Jamaica aircraft’s cone knocked off by Caribbean Airline’s right wing. The incident that led to the damage of two aircraft owned by Caribbean Airlines and Fly Jamaica early Tuesday morning appeared to have been caused by an alleged breach of air-side directive at the Cheddi Jagan International Airport (CJIA), according to well-placed sources. The Guyana Civil Aviation Authority (GCAA) has ordered that the two planes remain grounded until they are repaired and certified airworthy, the Director General of that regulatory agency, Retired Col, Egbert Field has said. The damaged Fly Jamaica plane. Its ripped off tail cone is on the ground. international apron clipped Fly Jamaica’s Boeing 767-300ER aircraft resulting in damage to the Auxiliary Power Unit Exhaust and tail wing of the aircraft. The right winglet of the CAL aircraft was also damaged. Fly Jamaica says it is currently using its airworthy Boeing 757-200 that is flying from Toronto to Kingston and then on to Georgetown, Guyana. 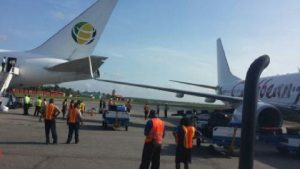 “We shall be back on schedule on Thursday morning,” Fly Jamaica’s Chairman and Chief Executive Officer, Paul Ronald Reece told Demerara Waves Online News. He said Fly Jamaica could also wet lease other aircraft if necessary.